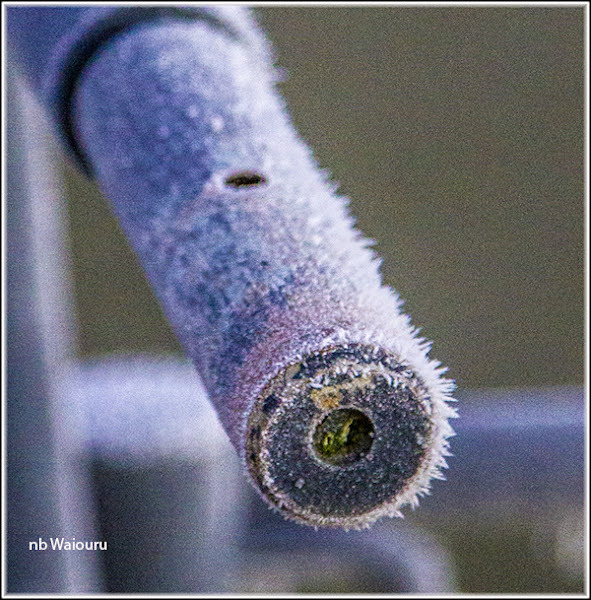 Jan awoke to our most severe frost to date. Meanwhile I just played possum under the 4.5 tog duvet. Yes, the boat is so warm we are still sleeping under the lightweight duvet. I sneaked one hand out of bed and pushed the central heating button. Jan did the right thing and lit the Refleks stove before opening the side hatch to feed the swans that had broken their way through the ice to eat MY biscuits AGAIN. Realising hell was going to freeze over before I received breakfast in bed I arose and wandered to the back of the boat braving the chill to take a few photos. 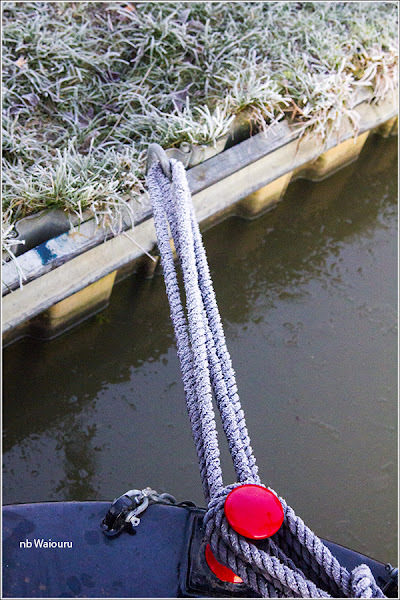 The mooring ropes were frozen stiff. I could have done the Indian rope trick with them. But then again, it was cold and breakfast was waiting. 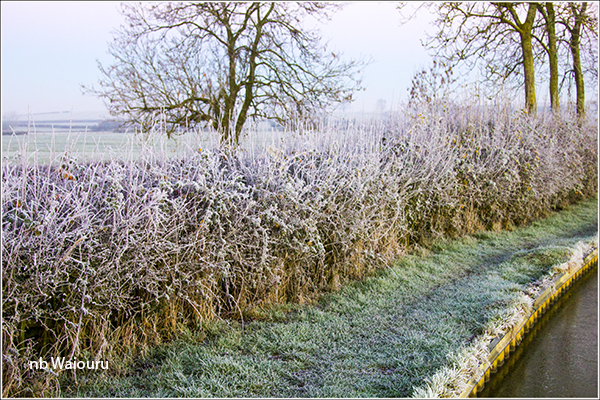 The canal had a thin layer of ice on top which I thought had broken up and was now just a coating of mush. It would appear I had once again made a mistake erred in my judgement. 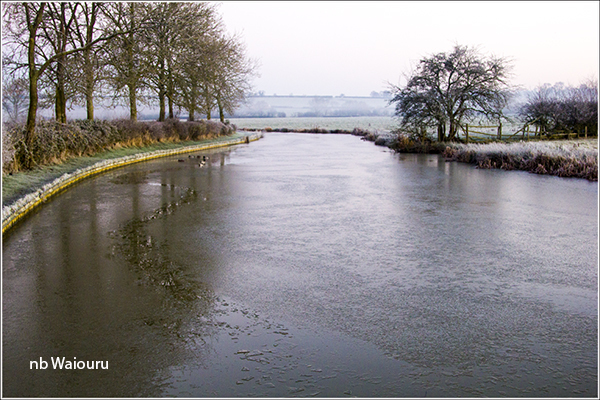 The ice might have melted at the very edges of the canal but it was 10mm thick in the middle. 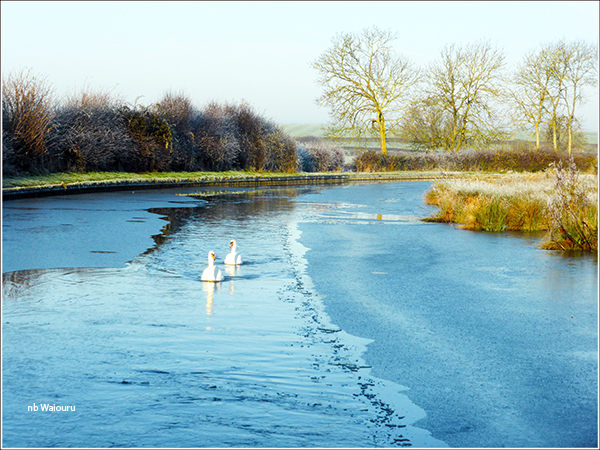 We headed off towards Braunston at 10am going at tick over speed slowly breaking our way through the ice. Rather surreal to be going at engine idle speed and hearing the loud snapping of ice. Not wanting to see their meal ticket depart, Jan’s two friends decided to tag along! About a kilometre from Braunston the ice disappeared and it was easy cruising. 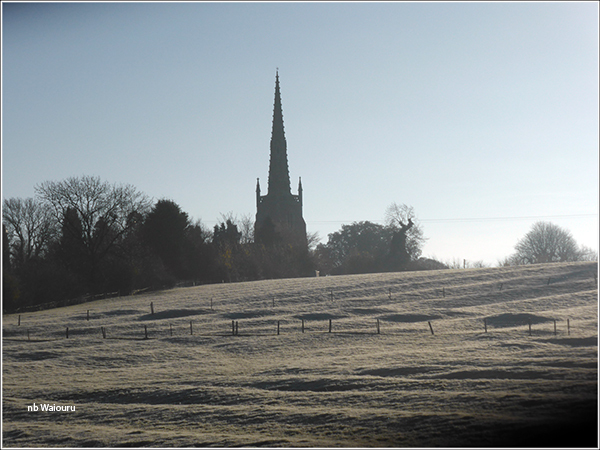 Jan managed to take a photo of the church despite the bright sunlight. A number of familiar boats were passed on the way to the marina entrance. Even two bloggers! Jan managed to take a quick snap of one but we were too busy waving or steering to take a photo of Oakfield. Maffi came knocking around 11am joining us for a cup of tea and a chat. 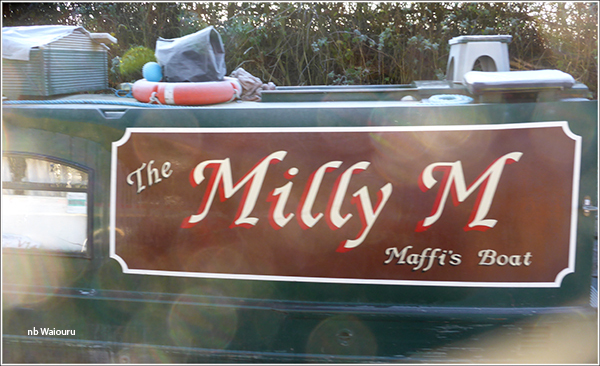 Also an invitation to join Oakfield and Milly M at the Boathouse for Sunday lunch tomorrow. Should be an interesting time.